As the best DUI Attorney in Los Angeles, the DUI Genius knows that there is a great deal of science behind most DUI arrests. 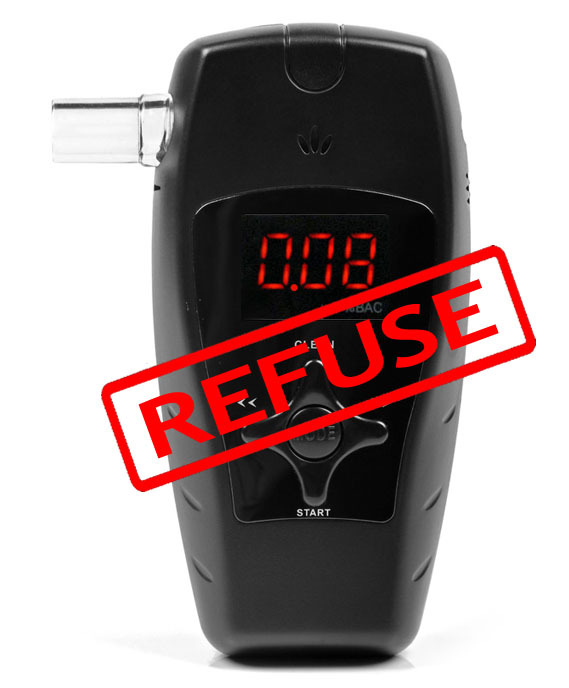 DUI breath-alcohol devices and the blood test are both subject to over 100 possible errors. In addition, not every person metabolizes alcohol the same way. 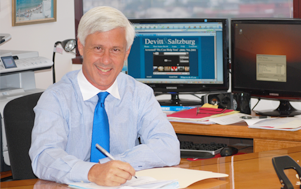 This can lead to a number of issues regarding DUI tests. When consuming alcohol, three processes take place in your body. The three processes are absorption, distribution and elimination of the alcohol from your body. Your stomach processes about 20% of the alcohol you drink and your small intestine processes the rest of the alcohol you drink during the absorption phase. The rate of absorption can change depending on whether or not you have eaten. Generally speaking, alcohol is absorbed within 45 minutes, but full absorption can take upwards of three hours. The next phase is the distribution phase – where alcohol is distributed through your entire body. Blood alcohol charts and breathalyzers (such as the Datamaster 2000 used in Los Angeles County) assume that alcohol is distributed evenly throughout your entire body. This simply isn’t true. Charts and devices differ from scientific fact when they assume that the amount of alcohol in the lungs is the same as in the brain. However, both medically and scientifically speaking, this isn’t correct; distribution is not uniform throughout your body. This means that the alcohol percentage can differ between limbs! Alcohol will not produce any impairing effects until it reaches the brain. Your liver metabolizes the alcohol and it is eventually “burned off”. This process takes place because your liver produces an enzyme called alcohol dehydrogenase and speeds up the interaction of oxygen and alcohol. This effectively eliminates the alcohol. This process produces carbon dioxide and water – explaining why you have to use the restroom more often when you drink. The average person burns off 0.015 grams of alcohol every hour. If your blood content is .08, then it should reduce to .065 one hour later. It is nearly impossible to gauge how alcohol is affecting you. A person drinking under normal conditions absorbs, distributes, and eliminates alcohol during the entire course of drinking. This makes it very hard to see how you were affected by alcohol at a certain point in time. The police may ask you to blow into a PAS machine when you are pulled over. DO NOT BLOW INTO THE MACHINE or participate in the FIELD SOBRIETY TESTS. These are voluntary procedures and by participating you are only creating evidence to use against you in court. DUI_Attorney_breathalyzer2The Preliminary Alcohol Screening device (PAS) is a small, portable device used to test your breath for traces of alcohol. 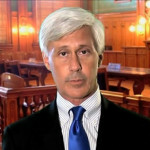 Some Judges do not allow its results to be used in court because it is so inaccurate. This test is not the “Datamaster” test, and it is not administered at the police station. If a police officer has a reason to believe that you may be intoxicated, the officer may request that you participate in a preliminary breath test. The police officer may then arrest you as a result of this preliminary chemical breath analysis. Given that 1) the device just is not accurate and 2) you can be arrested based upon the device’s results, it is not advisable that you submit to a PAS. If you get pulled over, do not breath directly on the officer (face forward instead), do not admit to drinking any liquor or any other violation of the law and do not answer any questions. You have the right to remain silent under the US Constitution – Fifth Amendment. You only have to give your name and show your driver’s license, proof of insurance, and registration of the car. In California, you must take a chemical test (blood or breath) if requested, (not a portable breath test). 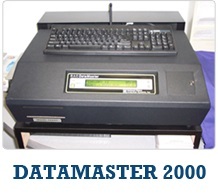 In Los Angeles County, the police use the DATAMASTER breathalyzer at the police station. The police officer administering the test must be properly trained and qualified to administer the test, and the Datamaster device must be regularly tested and certified in working order. Prior to administering the test the police officer is supposed to observe the arrested driver for 15 consecutive minutes. In practice this is rarely done. The reason for this is if you hiccup, burp, belch or vomit in those 15 minutes it will bring deep lung air up to be tested, which will make the machine register higher. The Datamaster is subject to a number of issues. This breathalyzer machine is designed to test only an average white male and uses this information to assume that the ratio of alcohol in your blood to the alcohol in your deep lung air or breath is 2100 to 1. We can challenge this! The machine assumes that there is no variance between people. The machine also assumes that your alcohol to breath ratio is the same that it was while you were driving. We can challenge this! Since these assumptions are based on averages, science has proven that these averages vary so much that a sober person can be classified as intoxicated. Even though the Datamaster is responsible for a number of problems, it is admissible as evidence of the defendant’s alcohol level. Here are a couple of charts that provide averages of how much alcohol is in your blood at any given time. Your body eliminates on average .015 grams of alcohol per hour. 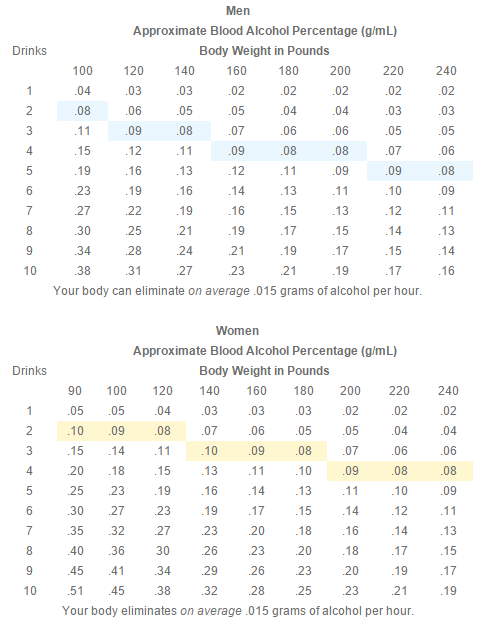 Blood alcohol averages are based on body weight and gender. These charts assume complete and immediate absorption of the alcohol contained in a standard drink. This assumption is, of course, medically and scientifically wrong, since it can take 20-30 minutes for absorption of alcohol but the charts are useful as a gauge to determine what a person’s blood alcohol is, after a specified number of drinks. Under the implied consent law, if you are arrested for a DUI in California, then you must submit to a chemical test by providing a sample of either breath or blood. A urine test may be ok under certain circumstances. If you refuse to provide a sample you will suffer a mandatory one-year suspension of driving privileges. If you refuse a blood sample in a DUI case, the police officer may force a blood-draw against your will. (See my blog). Blood tests are subject to error, however. A blood draw must be conducted by a properly certified blood-technician, nurse or phlebotomist. The experienced technician must then be sure to use an alcohol-free wipe when sanitizing your arm before your blood is drawn. The sanitizing wipes should not contain 2% ethyl alcohol which could lead to a false-positive. The procedure requires the blood to be drawn into a glass tube which contains a proper mixture of anticoagulant and sodium-fluoride preservative. Inaccurate amounts of either substance can result in a significantly flawed test and produce inaccurate results. Improper amounts of sodium-fluoride preservative may cause the blood to ferment and produce an alcohol like chemical in the blood. An insufficient amount of anticoagulant will cause the blood to clot and produce higher readings. When the blood is drawn, a qualified analyst is required to test the results at or around the time the blood is drawn. Finally, there must be a proper chain of custody. A chain of custody is going to require that everyone that handles the blood maintains an accurate written record of what happened to the blood. A proper chain of custody is the only reliable way to ensure that the blood sample belongs to the defendant. We can use this information to win your case if proper police procedures are not followed!